As with their funerals, Torajan graves are also quite distinctive and sometimes quite elaborate. 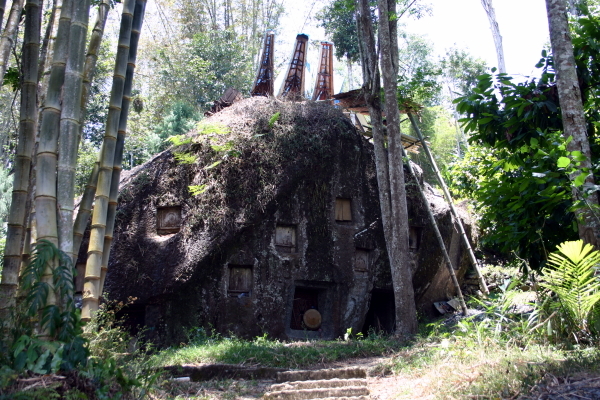 Where-ever you travel in Toraja, you will see these tombs, which are usually carved out of rock. The Torajan landscape is littered with huge boulders, evidence of some cataclysmic volcanic eruption thousands of years ago. On close inspection, you'll find that many of these boulders have 'doors'. The doors are the entrances to vaults where the Torajan keep their dead. The tombs are chiseled out of the solid rock by hand. Generally, a tomb may be big enough to hold a dozen or more coffins. These rock tombs are for the ordinary people, or at least those that can afford them, since the chiseling out of the tombs may cost several buffaloes. When asked why the Torajans spent so much on these tombs, which can cost much more than a house, my Torajan guide explained that their belief is that their family lives on in these tombs. They are, in effect, houses for the afterlife, like Egyptian tombs. Since the afterlife lasts a very long time, much longer than our earth-bound lives, the dead need much more substantial 'homes' than the living. There's also a practical aspect to using the boulders for tombs: Land free of the large stones is somewhat limited, so why waste valuable farm land on cemeteries? On the doors of some tombs, you'll see hats hanging, or perhaps there'll be a handbag or some other personal items left on the ledge in front of the door. As with the ancient Egyptians, the Torajans believe that their deceased loved ones 'need' these personal items to use in the afterlife. 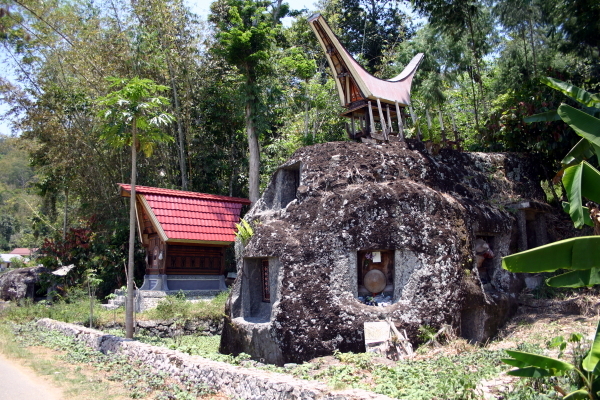 On top of, or beside the boulders, you may see small structures shaped like the traditional tongkonan houses. These are biers used to transport the coffin from the place where the funeral is held to the burial place. A new bier is constructed for every person, and used only once, then left at the tomb site. Unlike the biers, the tombs may be used for more than one person. Generally, they're treated like family crypts and can be filled with dozens of coffins over many years. The boulder tombs are just the simplest form of burial for the Torajans. Although the old Torajan royalty and upper classes no longer have any official roles, they still get star treatment in the afterlife. For one thing, instead of little boulders, royal tombs are carved into big cliff faces. But the really big difference are the tau tau. In addition to the tombs themselves, long balconies are carved into the solid rock. Along the balconies are placed wooden dolls called tau tau. The statues are about half life-size or a little bigger, and are dressed in clothes similar to the deceased person they represent. The arms of the statues are always outstretched, welcoming the descendants and others who come to visit. Originally, the tau tau were not intended to be exact representations of the dead, but the current trend is to make them look more like the dearly departed. Perhaps the most famous cliff tombs with tau tau are at Lemo, although there are also some interesting tombs at Buntao. The tau tau you will see are not the originals. European collectors long ago paid huge sums of money to buy the original statues from the families of the dead. 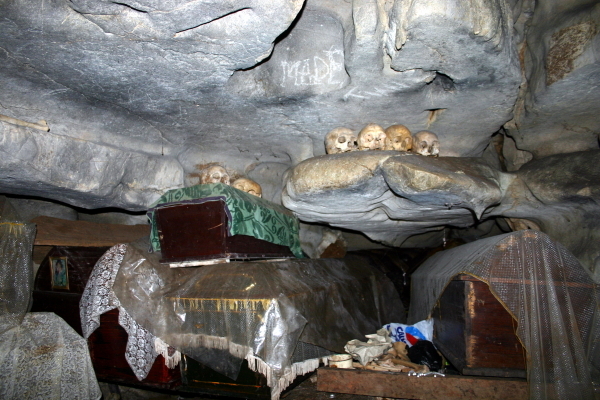 There are even more variations on burial practices around Toraja. 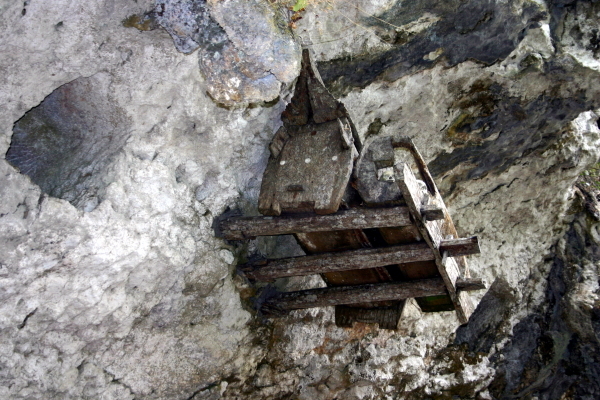 Near the woodworkers village at Ke'te Kesu is another cliff site, but instead of carving tombs into the rock, many of the coffins are placed on platforms suspended from the over-hanging face of the rock. The reasoning behind this practice is to prevent thieves from stealing precious items interred with the dead. The cliff at Ke'te Kesu has clearly been used for a very long time. Some of the coffins have fallen down, and sit cracked open on the rubble beneath the cliff. To make space, descendants of the dead have collected their bones into big piles left exposed. Down at Londa is what appears to be another cliff face tomb, but here there are also two caves which are also used to store coffins. At the front of the cliff is a huge pile of coffins. The coffins are simply left here to deteriorate and collapse, so that the base of the stack of coffins is nothing more than a deep pile of bones. Inside the caves, bones and coffins are stacked somewhat haphazardly in nooks and crannies. The same family has used these caves for more than 300 years, which is why there's such a large supply of coffins and bones. Babies who have not yet begun to get their teeth are buried differently than adults. Instead of stone tombs, they get interred in trees. A niche is carved out of a large tree, usually high above the ground, and the dead infant is secreted inside. A canvas-like cloth mat is used to cover the niche, but eventually the bark of the tree will close over the hole and there will be no trace of the baby. Only certain trees are used for this type of burial. These are two species which have white sap, since white is a 'holy' color. You will need to pay an entrance fee to see the tombs at Lemo, Buntao and Londa. In addition, at Londa you may need to pay for a guide with gas lamp to see the caves.